The Les Copains lounge chair by Brühl is made from a hot-dip galvanized frame and robinia top rail wrapped with wickerwork strings. Part of a collection of chairs, stools, and tables, it comes with optional cushions. Designer Glen Baghurst's Outdoor Events chair is made of powder-coated tubular steel and natural leather. Inspired by British campaign furniture, its small, space-efficient frame is designed low to the floor. 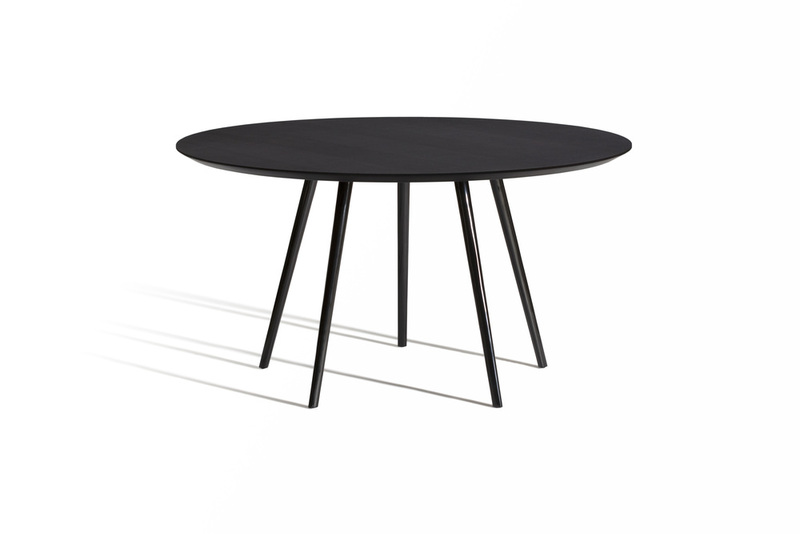 The Gazelle table, designed by Swedish studio Claesson Koivisto Rune for Capdell, comes with the option of three different tabletop shapes - round, oval, or rectangular - in varying materials and colors. Available in a range of fabrics and colors, Patricia Urquiola's modular Butterfly sofa comprises four different components that can be freely assembled and mixed and matched. 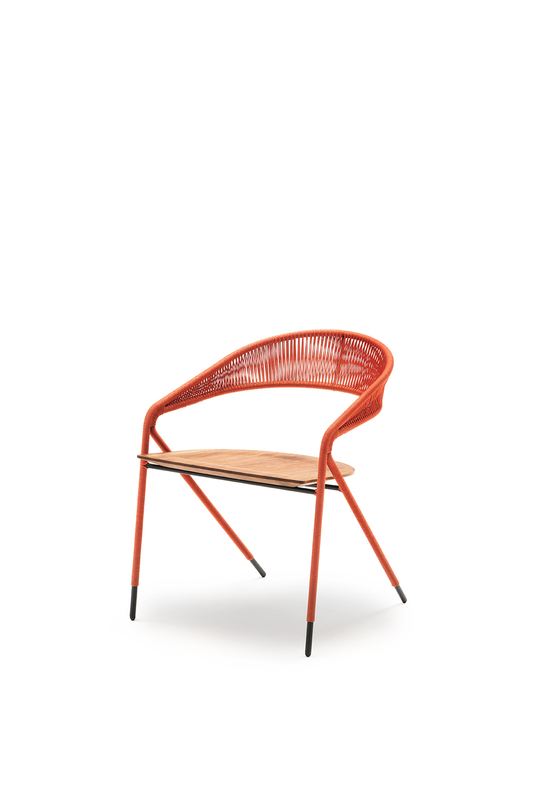 Designed by Richard Frinier for Brown Jordan, the Connexion armchair is made of extruded powder-coated aluminum. It comes in 28 different smooth or textured finishes, and 40 mesh fabrics for its siding and back. Designed by Enzo Mari, Driade's Elisa collection is made of a steel frame and generous polyurethane foam cushions with a removable fabric covering. Alternate covers also make it suitable for indoor use. 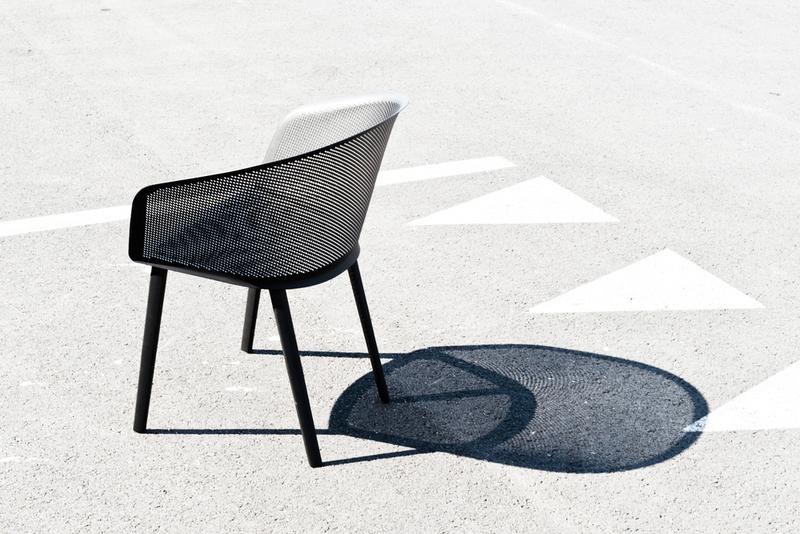 The George's rope chair by Living Divani incorporates waxed rope, wood, and metal with a triangular steel frame for a pleasing graphic element. Additional options include leather or wicker-woven models. 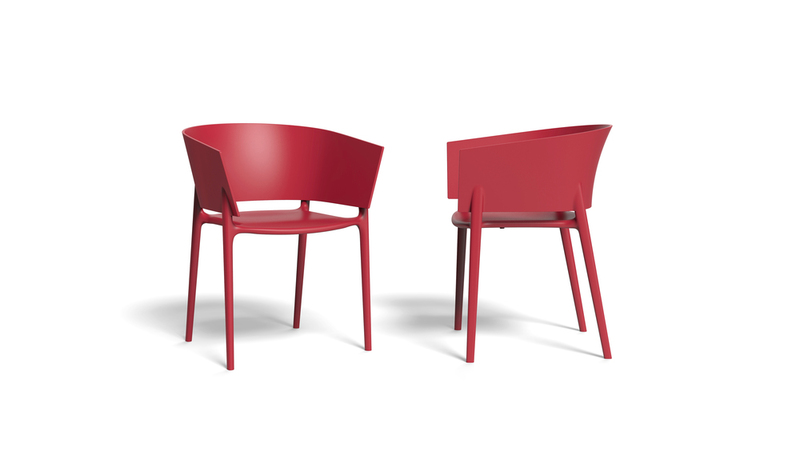 Kettal's Stampa armchair, designed by the Bouroullec brothers, is made entirely of durable, lightweight aluminum. It combines an injection-molded ring frame with a metal shell punched with a perforated pattern. The Hush chair, designed by Marc Thorpe for Moroso's M'Afrique collection, is made of yarn from fishing nets crafted by local Senegalese artisans. Its elongated back and sides take inspiration from corn stalks. Crate & Barrel's Morocco lounge chair pairs a powder-coated aluminum, UV-resistant frame with cushions upholstered in a special mildew-resistant acrylic fabric. Handwoven resin rope detailing gives it a subtly rustic feel. New York-based studio Visibility's prototype for the waterproof Poolside chair takes its formal cues from the archetypal slatted deck chair, elevated by complex formal geometries and a sensitivity to ergonomics. Gloster's Wedge lounge chair comes with all the comfort of an indoor armchair, matched with outdoor durability. Its plush lounge cushions are upholstered in eight different waterproof fabric colors. 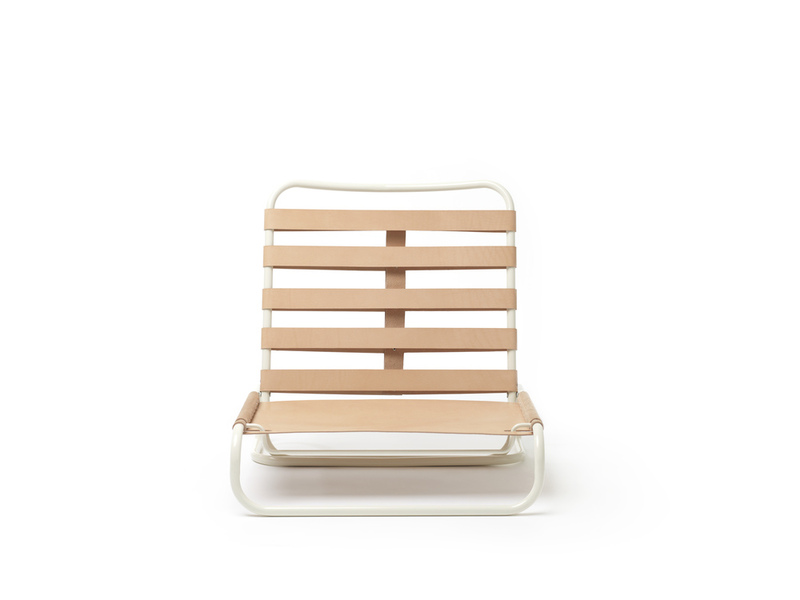 The steel frame and rope seat of the clean-lined Tituna chair, designed by Mariana Lerma for Gandia Blasco, comes in neutral tone palettes of white, sand, gray, bronze, and brown. The appeal of Harbour Outdoor's Balmoral seating lies not just in its sleek profile but also in its modularity. The sofa system allows for 12 different configurations of its removable cushions and arms, all offered in a variety of neutral Sunbrella fabrics. Ross Lovegrove's Biophilia collection for Vondom looks like a mash-up of set pieces from Tim Burton's productions of Beetlejuice and Alice in Wonderland. The polyethylene resin seating has a grip on the bottom so it stays put on wet surfaces. The rattanlike weave of the sidechairs and armchairs in Janus et Cie's Branch collection evokes the effect of tree-filtered sunlight. With reinforced polypropylene fibers stretching across the powder-coated aluminum frames, the line resists the weather's whims. German designer Stefan Diez's sporty Tropez collection for Gandia Blasco features everything from tables to poufs to chaises, each constructed with a durable aluminum structure and water-repellant upholstery- plus a hint of Roaring 20s-era style. Spanish designer Xavier Mañosa's Kettal Pussel series for Kettal provides a bright new perspective on subtle alfresco lighting. The playful, multi-use ceramic and glass objects can be used as oil lamps, vases, or purely decorative splashes of color. Mirto, designed by prolific Italian designer Antonio Citterio for B&B Italia, offers an ultra-slim take on a poolside classic. The seatback of this die-cast aluminum model can be adjusted for beach reading, drinking a beer, or catching rays in full repose. There's no need to sacrifice good taste for good times. The incognito You and Me pingpong table By Antoni Pallejà Office for RS Barcelona includes a removable Kvadrat-fabric net that can be stored in a side drawer built into the steel and iroko frame. The Quantum Parabolic chair for Brown Jordan, designed by Richard Frinier for the 30th anniversary of his original Quantum line, pairs comfort with durability. Its sleek silhouette features contoured mesh seating and a powder-coated, extruded-aluminum frame. 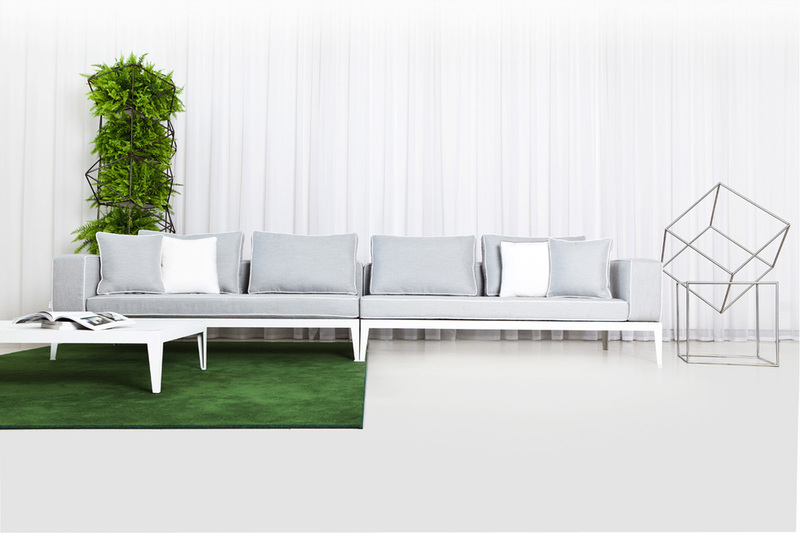 Differing foam densities, an aluminum frame, and a range of high-performance fabrics (Tempotest, Aquastop, and Duo Outdoor) make Expormim's modular, customizable Plump sofa system ideal for an outdoor lounge that can withstand the elements. Gandia Blasco's functional Stack chairs designed by Borja Garcia, fit on top of one another for easy storage when not in use. The minimal, thermo-lacquered aluminum frames are incredibly light, making retrieval just as painless. Conceived as a floating outdoor living room, Daniel Pouzet's Swing Us canopy loveseat for Dedon comprises a basket frame suspended by four handwoven, fiber strands. Two can sit comfortably on the unit. A backrest comes in a chalk or natural-wood finish. 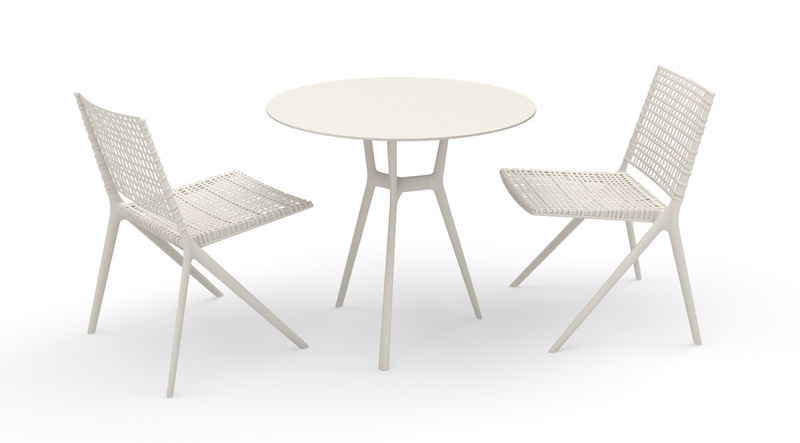 Avenue Road's Outdoor 1 table, designed by Marlieke Van Rossum, comes with a powder-coated aluminum base and flared legs. A stain-treated oak tabletop is available in three finishes: natural, transparent white, and transparent black. The Piña chair- named for its gently rounded, pineapple-shaped wire frame- was designed by Jamie Hayon for Magis and showed at this year's Salone del Mobile fair. The steel-tube frame is painted in epoxy resin and paired with a polyurethane back. Inspired by sleek yachts of the French Riviera, Carsten Astheimer's Vista lounge chair for Gloster combines horizontal lines with curved sides to evoke a simple nautical aesthetic. Base cushions are water-resistant; the frame comes in a frost or tungsten color. Patricia Urquiola's Mesh sofa for Kettal is a study in contrasts, combining soft and sturdy textures with solid and transparent surfaces. Upholstered cushions sit on an accoya base that's wrapped in a mesh metal frame reminiscent of an architectural facade. For the new Cast collection series, Brooklyn-based studio Uhuru crafted its original Stoolen in quarter-inch-thick metal for outdoor use. Hand-built to order, the piece can be used as either a seat or sidetable, and is available in bronze (pictured) and aluminum. Clean lines and monochrome colors give the Africa chair by Eugeni Quitllet for Vondom the stately elegance of a pressed and starched collar. The plastic chair comes in 15 different colors, including ecru, taupe, khaki, pistachio, and plum. Woven, stamped, and wrapped, textured details lend these outdoor pieces sophistication and charm.